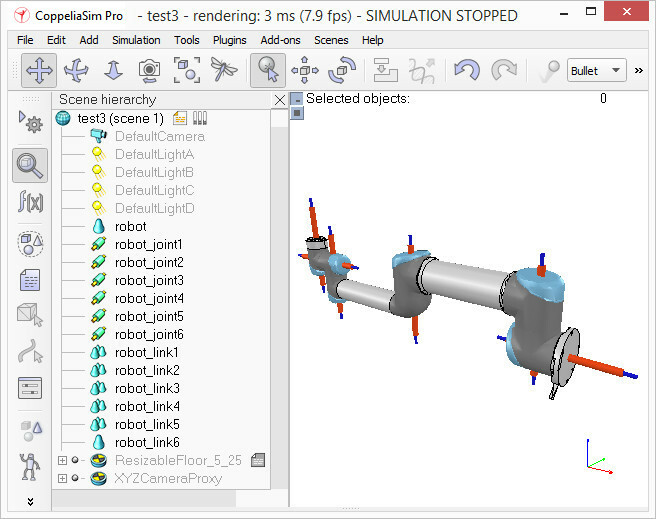 This tutorial will guide you step-by-step into building a clean simulation model, of a robot, or any other item. This is a very important topic, maybe the most important aspect, in order to have a nice looking, fast displaying, fast simulating and stable simulation model. 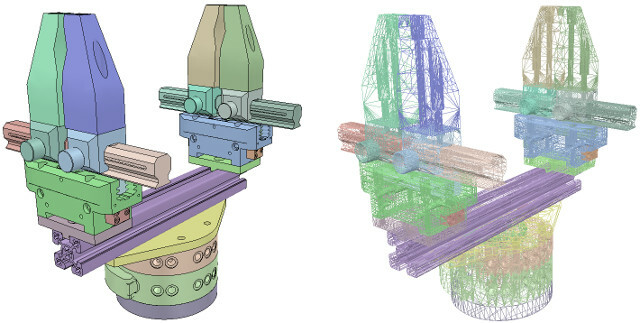 When building a new model, first, we handle only the visual aspect of it: the dynamic aspect (its undelying even more simplified/optimized model), joints, sensors, etc. will be handled at a later stage. We could now directly create primitive shapes in V-REP with [Menu bar --> Add --> Primitive shape --> ...]. When doing this, we have the option to create pure shapes, or regular shapes. Pure shape will be optimized for dynamic interaction, and also directly be dynamically enabled (i.e. fall, collide, but this can be disabled at a later stage). Primitive shapes will be simple meshes, which might not contain enough details or geometric accuracy for our application. Our other option in that case would be to import a mesh from an external application. Above CAD data is very heavy: it contains many triangles (more than 47'000), which would be ok if we would just use a single instance of it in an empty scene. 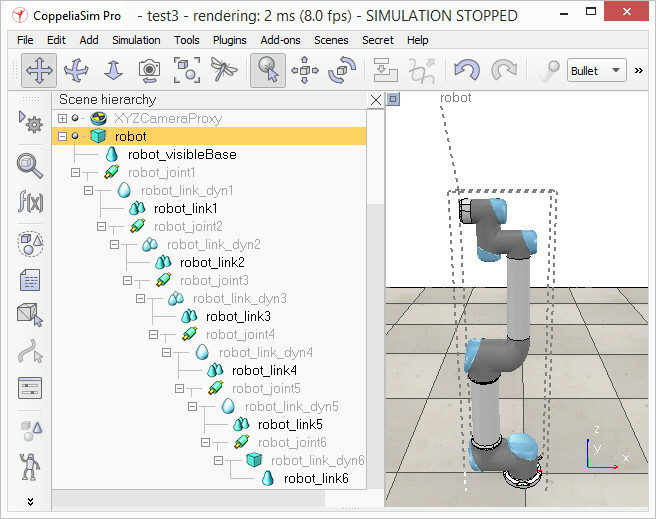 But most of the time you will want to simulate several instances of a same robot, attach various types of grippers, and maybe have those robots interact with other robots, devices, or the environment. In that case, a simulation scene can quickly become too slow. Generally, we recommend to model a robot with no more than a total of 20'000 triangles, but most of the time 5'000-10'000 triangles would just do fine as well. Remember: less is better, in almost every aspect. What makes above model so heavy? 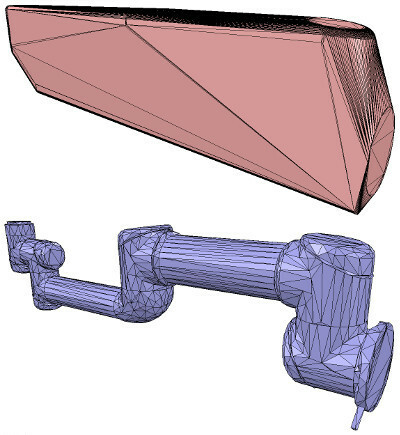 First, models that contain holes and small details will require much more triangular faces for a correct representation. So, if possible, try to remove all the holes, screws, the inside of objects, etc. from your original model data. If you have the original model data represented as parametric surfaces/objects, then it is most of the time a simple matter of selecting the items and deleting them (e.g. 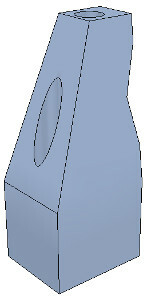 in Solidworks). The second important step is to export the original data with a limited precision: most CAD applications let you specify the level of details of exported meshes. It might also be important to export the objects in several steps, when the drawing consists of large and small objects; this is to avoid having large objects too precisely defined (too many triangles) and small objects too roughly defined (too few triangles): simply export large objects first (by adjusting the desired precision settings), then small objects (by adjusting up precision settings). 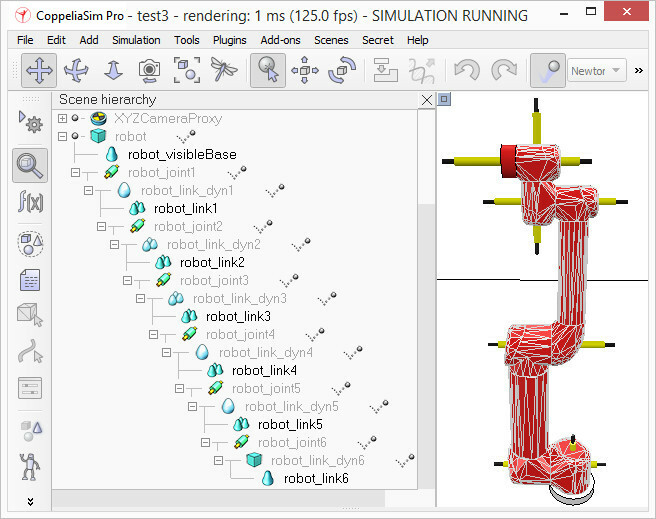 V-REP supports currently following CAD data formats: OBJ, STL, DXF, 3DS (Windows only), and Collada. URDF is also supported, but not mentionned here since it is not a pure mesh-based file format. You can notice that the whole robot was imported as a single mesh. We will see later how to divide it appropriately. 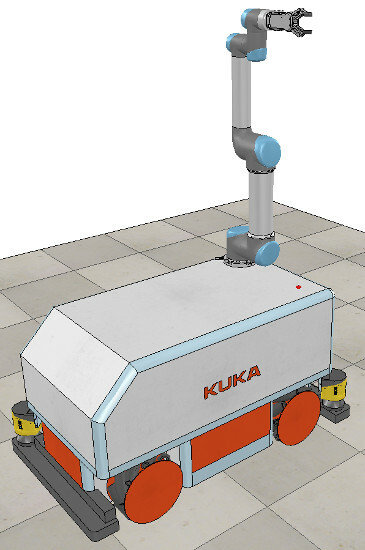 Notice also the wrong orientation of the imported mesh: best is to keep the orientation as it is, until the whole model was built, since, if at a later stage we want to import other items that are related to that same robot, they will automatically have the correct position/orientation relative to the original mesh. Automatic mesh division: allows to generate a new shape for all elements that are not linked together via a common edge. This does not always work for the selected mesh, but is always worth a try, since working on mesh elements gives us more control than if we had to work on all elements at the same time. The function can be accessed with [Menu bar --> Edit --> Grouping/Merging --> Divide selected shapes]. Sometimes, a mesh will be divided more than expected. In that case, simply merge elements that logically belong together (i.e. that will have the same visual attributes and that are part of the same link) back into one single shape ([Menu bar --> Edit -> Grouping/Merging --> Merge selected shapes]). 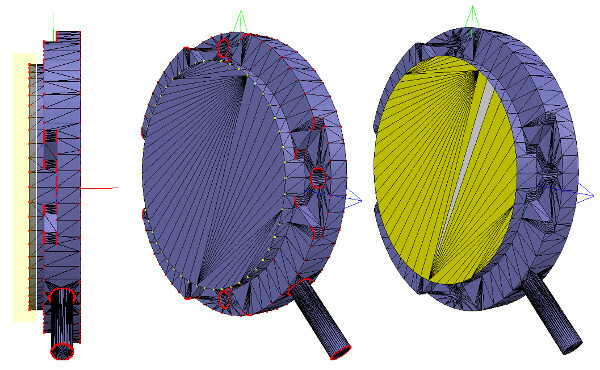 Extract the convex hull: allows to simplify the mesh by transforming it into a convex hull. The function can be accessed with [Menu bar --> Edit --> Morph selection into convex shapes]. 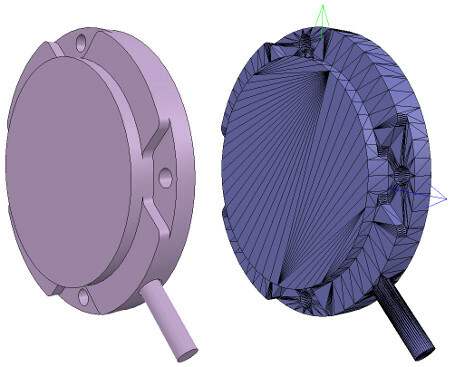 Decimate the mesh: allows to reduce the number of triangles contained in the mesh. The function can be accessed with [Menu bar --> Edit --> Decimate selected shape...]. Remove the inside of the mesh: allows to simplify the mesh by removing its inside. This function is based on vision sensors and might give more or less satisfying results depending on the selected settings. The function can be accessed with [Menu bar --> Edit --> Extract inside of selected shape]. Notice how the convex hull doesn't help us at this stage. We decide to use the mesh decimation function first, and run the function twice in order to divide the number of triangles by a total of 50. Once that is done, we extract the inside of the simplified shape and discard it. We end-up with a mesh containing a total of 2'660 triangles (the original imported mesh contained more than 136'000 triangles!). The number of triangles/vertices a shape contains can be seen in the shape geometry dialog. 2'660 triangles are extremely few triangles for a whole robot model, and the visual appearance might suffer a little bit from it. Automatic mesh division: this function, which was already described in previous section, will inspect the shape and generate a new shape for all elements that are not linked together via a common edge. This does not always work, but is always worth a try. The function can be accessed with [Menu bar --> Edit --> Grouping/merging --> Divide selected shapes]. Manual mesh division: via the the triangle edit mode, you can manually select the triangles than logically belong together, then click Extract shape. This will generate a new shape in the scene. Delete the selected triangles after that operation. The problem with above's shape is that we cannot simplify it nicely, because of the holes it contains. So we have to go the more complicated way via the shape edit mode, where we can extract individual elements that logically belong to the same convex sub-entity. This process can take several iterations: we first extract 3 approximate convex elements. For now, we ignore the triangles that are part of the two holes. While editing a shape in the shape edit mode, it can be convenient to switch the visibility layers, in order to see what is covered by other scene items. In V-REP, we can enable/disable edge display for each shape. We can also specify an angle that will be taken into account for the edge display. A similar parameter is the shading angle, that dictates how facetted the shape will display. Those parameters, and a few others such as the shape color, can be adjusted in the shape properties. Remember that shapes come in various flavours. In this tutorial we have only dealt with simple shapes up to now: a simple shape has a single set of visual attributes (i.e. one color, one shading angle, etc.). If you merge two shapes, then the result will be a simple shape. You can also group shapes, in which case, each shape will retain its visual attributes. When a shape is created or modified, V-REP will automatically set its reference frame position and orientation. A shape's reference frame will always be positioned at the shape's geometric center. The frame orientation will be selected so that the shape's bounding box remains as small as possible. This does not always look nice, but we can always reorient a shape's reference frame at any time. We now reorient the reference frames of all our created shapes with [Menu bar --> Edit --> Reorient bounding box --> with reference frame of world]. You have more options to reorient a reference frame in the shape geometry dialog. dynamic or static: a dynamic (or non-static) shape will fall and be influences by external forces/torques. A static (or non-dynamic) shape on the other hand, will stay in place, or follow the movement of its parent in the scene hierarchy. respondable or non-respondable: a respondable shape will cause a collision reaction with other respondable shapes. They (and/or) their collider, will be influenced in their movement if they are dynamic. On the other hand, non-respondable shapes will not compute a collision response if they collide with other shapes. Pure shapes: a pure shape will be stable and handled very efficiently by the physics engine. The draw-back is that pure shapes are limited in geometry: mostly cuboids, cylinders and spheres. If possible, use those for items that are in contact with other items for a longer time (e.g. the feet of a humanoid robot, the base of a serial manipulator, the fingers of a gripper, etc.). Pure shapes can be created with [Menu bar --> Add --> Primitive shape]. Pure compound shapes: a pure compound shape is a grouping of several pure shapes. It performs almost as well as pure shapes and shares similar properties. Pure compound shapes can be generated by grouping several pure shapes [Menu bar --> Edit --> Grouping/Merging --> Group selected shapes]. Convex shapes: a convex shape will be a little bit less stable and take a little bit more computation time when handled by the physics engine. It allows for a more general geometry (only requirement: it need to be convex) than pure shapes. If possible, use convex shapes for items that are sporadically in contact with other items (e.g. the various links of a robot). Convex shapes can be generated with [Menu bar --> Add --> Convex hull of selection] or with [Menu bar --> Edit --> Morph selection into convex shapes]. Compound convex shapes, or convex decomposed shapes: a convex decomposed shape is a grouping of several convex shapes. It performs almost as well as convex shapes and shares similar properties. Convex decomposed shapes can be generated by grouping several convex shapes [Menu bar --> Edit --> Grouping/Merging --> Group selected shapes], with [Menu bar --> Add --> Convex decomposition of selection...], or with [Menu bar --> Edit --> Morph selection into its convex decomposition...]. Random shapes: a random shape is a shape that is not convex nor pure. It generally has poor performance (calculation speed and stability). Avoid using random shapes as much as possible. So the order of preference would be: pure shapes, pure compound shapes, convex shapes, compound convex shapes, and finally random shapes. Make sure to also read this page. In case of the robot we want to build, we will make the base of the robot as a pure cylinder, and the other links as convex or convex decomposed shapes. We could use the dynamically enabled shapes also as the visible parts of the robot, but that would probably not look good enough. So instead, we will build for each visible shape we have created in the first part of the tutorial a dynamically enabled counterpart, which we will keep hidden: the hidden part will represent the dynamic model and be exclusively used by the physics engine, while the visible part will be used for visualization, but also for minimum distance calculations, proximity sensor detections, etc. We still need to take care of a few things: first, since we want the dynamic shapes only visible to the physics engine, but not to the other calculation modules, we uncheck all object special properties for the dynamic shapes, in the object common properties. Then, we still have to configure the dynamic shapes as dynamic and respondable. We do this in the shape dynamics properties. Select first the base dynamic shape (i.e. robot_dyn), then check the Body is respondable item. Enable the first 4 Local respondable mask flags, and disable the last 4 Local respondable mask flags: it is important for consecutive respondable links not to collide with each other. For the first mobile dynamic link in our robot (i.e. robot_link_dyn1), we also enable the Body is respondable item, but this time we disable the first 4 Local respondable mask flags, and enable the last 4 Local respondable mask flags. 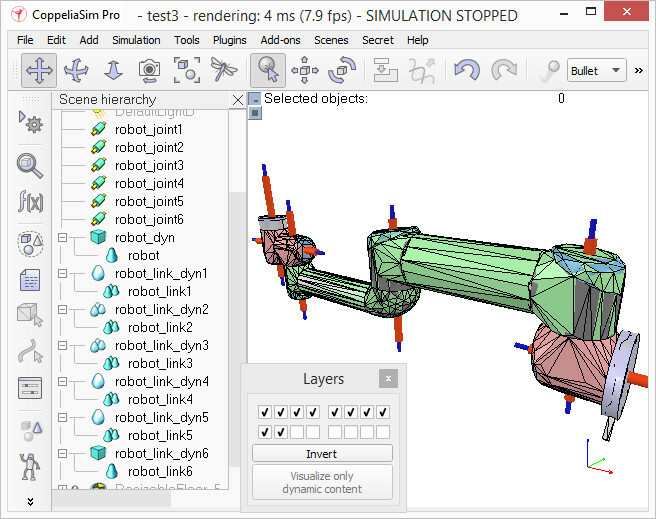 We repeat the above procedure with all other dynamic links, while always alternating the Local respondable mask flags: once the model will be defined, consecutive dynamic shapes of the robot will not generate any collision response when interacting with each other. 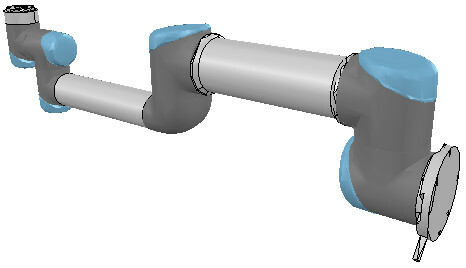 Try to always end up with a construction where the dynamic base of the robot, and the dynamic last link of the robot have only the first 4 Local respondable mask flags enabled, so that we can attach the robot to a mobile platform, or attach a gripper to the last dynamic link of the robot without dynamic collision interferences. Finally, we still need to tag our dynamic shapes as Body is dynamic. We do this also in the shape dynamics properties. We can then enter the mass and inertia tensor properties manually, or have those values automatically computed (recommended) by clicking Compute mass & inertia properties for selected convex shapes. Remember also this and that dynamic design considerations. This dynamic base of the robot is a special case: most of the time we want the base of the robot (i.e. robot_dyn) to be non-dynamic (i.e. 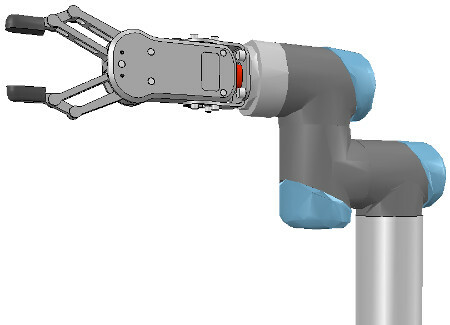 static), otherwise, if used alone, the robot might fall during movement. But as soon as we attach the base of the robot to a mobile platform, we want the base to become dynamic (i.e. non-static). We do this by enabling the Set to dynamic if gets parent item, then disabling the Body is dynamic item. Now run the simulation: all dynamic shapes, except for the base of the robot, should fall. That attached visual shapes will follow their dynamic pendants. We now protect our model from accidental modification. 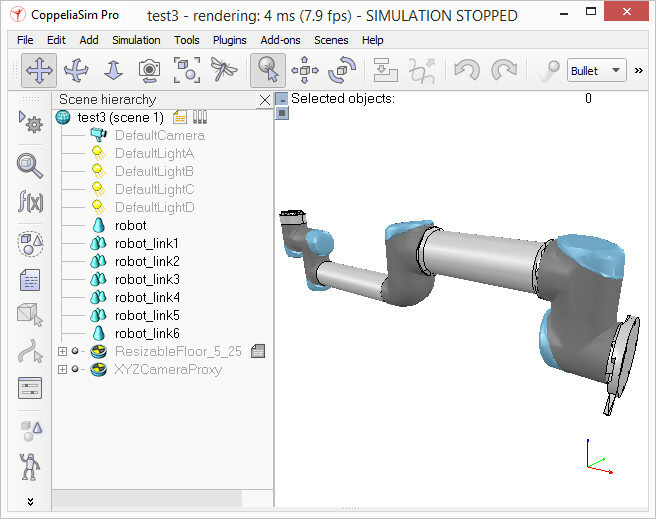 We select all visible objects in the robot, then enable Select base of model instead: if we now click a visible link in the scene, the base of the robot will be selected instead. This allows us to manipulate the model as if it was a single object. We can still select visible objects in the robot via control-shift-clicking in the scene, or by selecting the object in the scene hierarchy. We now put the robot into a correct default position/orientation. First, we save current scene as a reference (e.g. 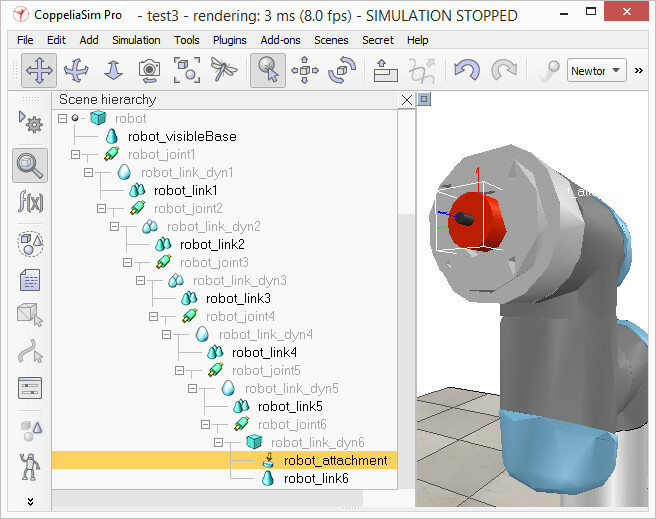 if at a later stage we need to import CAD data that have the same orientation at the curent robot). Then we select the model and modify its position/orientation appropriately. It is considered good practice to position the model (i.e. its base object) at X=0 and Y=0. We now run the simulation: the robot will collapse, since the joints are not controlled by default. When we added the joints in the previous stage, we created joints in force/torque mode, but their motor or controller was disabled (by default). We can now adjust our joints to our requirements. In our case, we want a simple PID controller for each one of them. In the joint dynamic properties, we click Motor enabled and adjust the maximum torque. We then click Control loop enabled and select Position control (PID). We now run the simulation again: the robot should hold its position. Try to switch the current physics engine to see if the behaviour is consistent across all supported physics engines. You can do this via the appropriate toolbar button, or in the general dynamics properties. During simulation, we now verify the scene dynamic content via the Dynamic content visualization & verification toolbar button. Now, only items that are taken into account by the physics engine will be display, and the display is color-coded. It is very important to always do this, and specially when your dynamic model doesn't behave as expected, in order to quickly debug the model. Similarly, always look at the scene hierarchy during simulation: dynamically enabled objects should display a ball-bounding icon on the right-hand side of their name. by grouping them: select the shapes, then [Menu bar --> Edit --> Grouping/Merging --> Group selected shapes]. 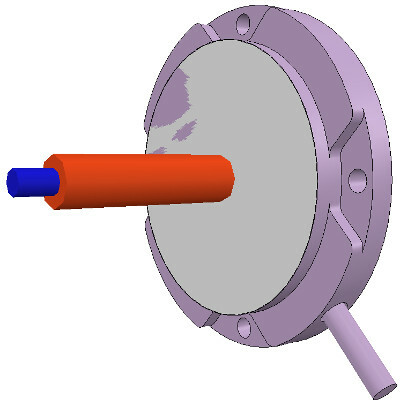 by attaching them via a force/torque sensor: a force torque sensor can also act as a rigid link between two separate dynamically enabled shapes. Now we could add additional items to our robot, such as sensors for instance. At some point we might also want to attach embedded scripts to our model, in order to control its behaviour or configure it for various purposes. In that case, make sure to understand how object handles are accessed from embedded scripts. We can also control/access/interface our model from a plugin, from a remote API client, from a ROS node, from a BlueZero node, or from an add-on. 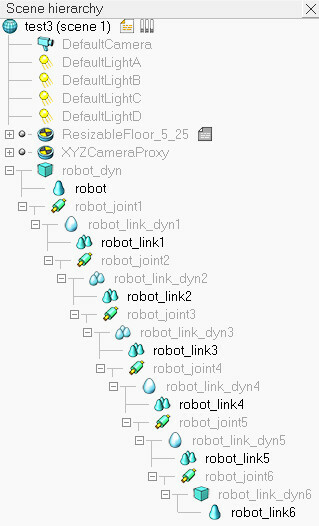 Now we make sure we have reverted the changes done during robot and gripper attachment, we collapse the hierarchy tree of our robot model, select the base of our model, then save it with [Menu bar --> File --> Save model as...]. If we saved it in the model folder, then the model will be available in the model brower.